WASHINGTON, D.C., Feb. 2 (SEND2PRESS NEWSWIRE) — In honor of American Heart Month this February, the Gingrich Foundation, founded by Callista and Newt Gingrich, has selected the American Heart Association as its Charity of the Month for its commitment to improving cardiovascular health for all Americans. Cardiovascular disease claims more lives each year than any other disease in America. Nine out of ten people in the United States have at least one risk factor for heart disease, including obesity, high cholesterol, physical inactivity, or high stress levels. The American Heart Association (AHA) last year launched its 2020 Impact Goal: to improve the cardiovascular health of all Americans by 20 percent while reducing deaths from cardiovascular diseases and stroke by an additional 20 percent. AHA funds cutting-edge research, conducts lifesaving public and professional education programs, and advocates for the protection of public health through increased awareness and donor contributions. This includes the “My Heart. My Life.” healthy behavior platform, Go Red for Women campaign and Teaching Gardens program to encourage children to be heart-healthy. The Gingrich Foundation is a domestic non-profit corporation founded by Callista and Newt Gingrich to support charitable purposes. 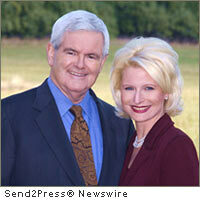 – RSS news feed for Gingrich Foundation: https://send2pressnewswire.com/author/gingrich-foundation/feed . Original Keywords: American Heart Month, American Heart Association, Washington DC news, corporate social responsibility, health, Callista and Newt Gingrich, Charity of the Month, Debra Lockwood, Go Red for Women and Wear Red Day on February 4, 2020 Impact Goal, AHA Gingrich Foundation Washington District of Columbia WASHINGTON, D.C.
REFERENCES: Fitness News, American Heart Month, American Heart Association, Washington DC news, corporate social responsibility, health, Callista and Newt Gingrich, Charity of the Month, Debra Lockwood, Go Red for Women and Wear Red Day on February 4, 2020 Impact Goal, AHA Gingrich Foundation Washington District of Columbia WASHINGTON, D.C.